Though faithful men and devout followers of Muhammad, peace be with him, they would rather tend to their farms then be forced to fight. Taken from their dwellings by a personal guard to the nearest city, they doubt they will ever see their farms or families again. 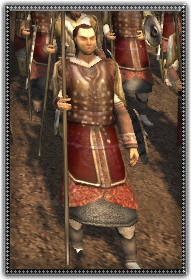 Owning some land in the Fertile Crescent means they could also afford some individual armor. Hardy men accustomed to deserts and heat, can thrust their spears into cavalry efficiently.